My newest post was going to be about adventures in quilting, since I just got back from nearly non-stop sewing from Thursday afternoon through Sunday afternoon. And that post IS coming. I just got bogged down with work today and didn't have time to download (or upload---I always get those confused) my pictures. So...(not "sew....."--I'll save that for the next post) I was catching up on my blog reading since I have been without my computer since Thursday. 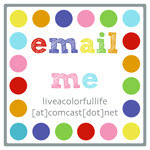 And as I'm scrolling down on one of my favorites, written by someone I will probably never meet in person (but sure would like to), I see "Live a Colorful Life" listed in her blog roll under "blogs I dig." 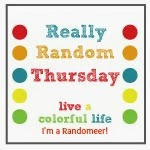 This isn't the first time I have made a blog roll, but all the others have been friends and family, and really, they're almost obligated, right? So thanks, K--you made my day!